“Life’s most persistent and urgent question is: ‘What are you doing for others? '” – Dr Martin Luther King Jr.
Every year, working people come together to honor Dr. Martin Luther King Jr’s legacy of service and compassion for MLK Jr. weekend. Many actions and events planned around the state prove 2017 is no different. We’ve rounded up options available statewide. Join us for a weekend of service to honor Dr. King! In memory of Ghost Ship fire victims. 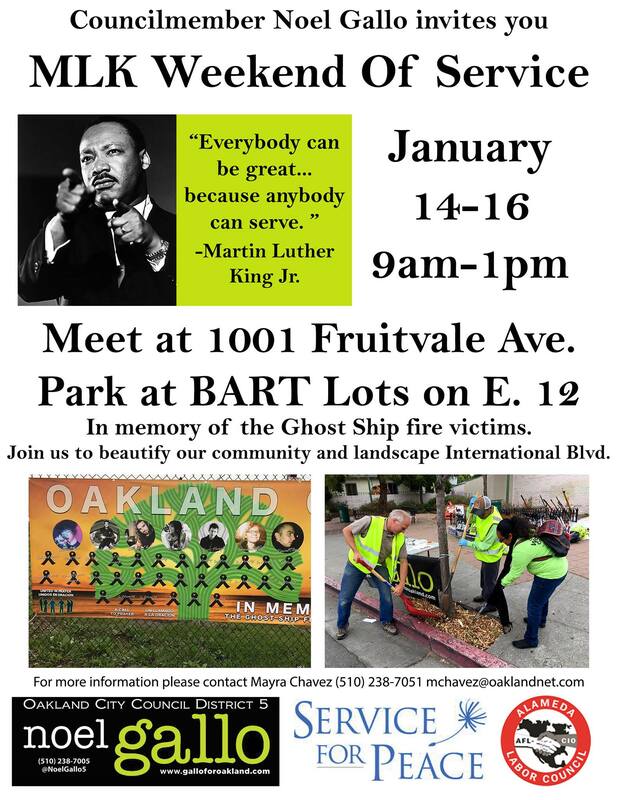 Join working people and Councilmember Noel Gallo to beautify our community and landscape International Blvd in memory of the Ghost Ship fire victims. Jan 14-16, 9am-1pm. Meet at 1001 Fruitvale Ave, park at BART Lots on E. 12. Contact Rosa Advincula at the Alameda Labor Council ( for more information (rosa@alamedalabor.org). Download the flyer here. Featuring Honoree Dolores Huerta. Monday January 16th, 2017 8am-10am. At the Marriott Marquis Hotel (780 Mission St, San Francisco). Reserve tickets online here. See all of the San Francisco MLK2017 events at sfmlkday.org . Download the flyer here. Join the Western Workers Labor Heritage Festival ReUnion in Santa Cruz January 15th! We are bringing together cultural activists to share Dr. King’s legacy to address the current climate crisis of environmental, racial, sexual and economic injustice. Enjoy the songs, stories, and calls to actions by a collage of performing artists from the Bay area and beyond. Proceeds will benefit the John Handcox Scholarship Fund, to support bringing people of color to attend the Great Labor Arts Exchange near Washington DC. Evening concert begins at 630 features 30 Years After: Uniting and Fighting Beyond J 20. The LA Fed’s annual Martin Luther King Jr. Breakfast is planned for Saturday, January 14. This year’s theme is “Freed to Succeed” to honor our first graduating class of the LA Fed’s Pre-Apprenticeship Bootcamp. We are fighting to create opportunities for the formerly incarcerated, because they too deserve a chance at the American Dream. Click here for information on sponsorship opportunities and to confirm attendance.